“In wholesale market it is all about the price gamble and no one is ever bothered about the quality of the farm products be it vegetables, pulses, rice or any other agri commodity. Traders would buy the vegetables at Rs. 2/kg from the farmers unaffected if it is grown organically or with chemicals and it keeps getting circulated till the end consumer pays Rs. 15/kg for the same. In this process the nutritive value of the produce is also lost! I wanted to be out of this system hence decided to sell my farm produce directly to the end consumers. To facilitate the communication with my customers I use WhatsApp through which I inform them about the next day harvesting schedule and they place the order. Following day post harvesting, within couple of hours’ fresh vegetables reach customers’ door steps. The price is fixed competitively to market rates of conventionally grown vegetables. As a result, customer is happy to receive freshly harvested vegetables packed with the nutrients every day and I am happy to earn three folds more money than the old system of selling the farm produce to the trader. 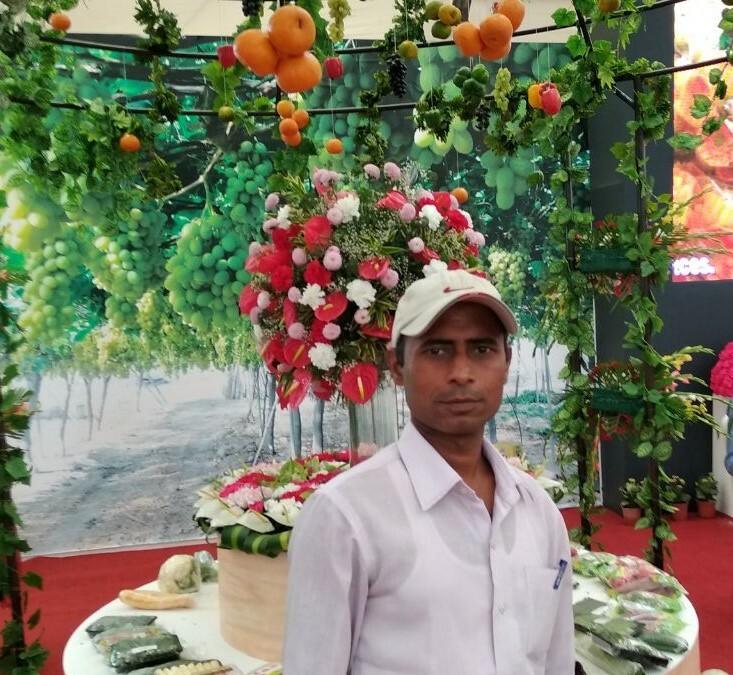 Besides, I also receive priceless testimonials from the happy customers that motivates me to keep going the organic way,” asserts Mr. Amit Mishra, progressive farmer from Bhoya village, Faizabad district, Uttar Pradesh. The village is 32 km far from Faizabad city. 1.5-hectare farm of Mr. Mishra is family run farm. Earlier traditional crops namely wheat, paddy and sugarcane were cultivated using chemical based agri inputs but since last 1.5 years the farm has been turned into 100% organic. 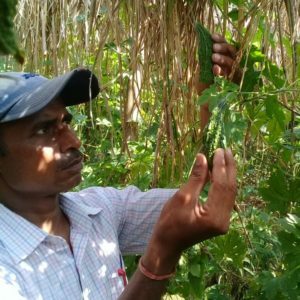 In 1000 square meter through multi-layer farming model he is growing vegetables, ½ acre has pigeon pea cultivation and in one-acre paddy is cultivated using drum seeder. Rest of the farm is left fallow to revive the soil. “Soon the entire farm shall be under cultivation. I am in the conversion process therefore bringing the change step-by-step,” he informs. 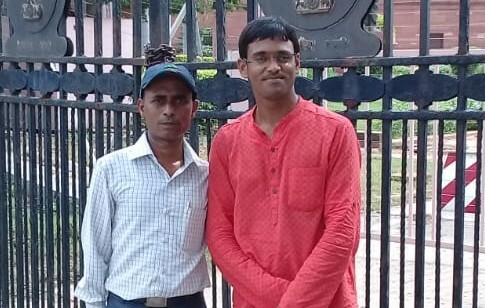 Prior to taking farming as full time profession, Mr. Mishra did mundane jobs in Delhi and Bangalore as well as did some business but shut it down after incurring loss. Further, being from agricultural based family due to certain circumstances he had to take up the responsibility of his farm. Nevertheless, he took up the responsibility and started doing farming in the conventional way. “After analyzing the production cost and income generated I found the net profit is negligible! Therefore, to increase the farm revenues I moved towards cultivation and processing aromatic crops for industrial buyers precisely tulsi essential oil and menthol essential oil. Indeed, it was profitable than growing the traditional crops but due to far location of storage and distilling unit again the production cost exceeded the sales figures! Then after I resumed traditional farming but was looking for some commercial crops to bring the desired change in the farm revenues. Taking the advice from a well-wisher I started growing vegetables. In the process I closely experienced harmful effects of pesticides on vegetables and was shocked to see its after-effects hence immediately stopped use of chemical agri inputs and started cow-based farming,” he describes the drive to turn into an organic farmer. Entire farm is nurtured with various farm made manures such as vermicompost, sour buttermilk spray, waster decomposer from Ghaziabad, matka khad, neem oil spray etc. 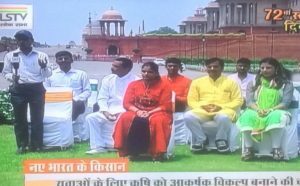 “I do not buy any chemical based agri inputs in my farm now,” he assures. In order to practice chemical free farming Mr. Mishra began intense research on internet and found multiple solutions. One such attractive method was multi-layer farming model developed by Sagar, Madhya Pradesh based Mr. Aakash Chaurasiya. “I took training under him and implemented his invented model in my farm in 1000 square meters. The main attractive feature of this model is that input cost is minimum while output is maximum. Earlier to grow okra roughly Rs. 250+ was spent on pesticides and nutrients and another Rs. 50 on labor charges etc. The okra was then sold at Rs. 300-350 in wholesale mandi, thus the end profits were negligible. Thereby multi-layer farming proved much more gainful as it is done organically therefore the production cost is very less and yield is more by many folds,” he affirms. Primarily vegetables are cultivated in multi-layer farming model, underground root crop grown is ginger, on the top surface crops grown are green vegetables, Ivy Gourd(calledkundru in Hindi) and bitter gourd as creeper vegetables in third layer and papaya in the fourth layer. All the seeds used are indigenous varieties. “In order to have more variety, in case of green vegetables, I have divided entire land in four equal parts in which I am growing four types greens namely amaranth, marsha (kind of amaranth), coriander and spinach. The area near vermicompost was left ideal therefore I planted four more creepers that would grow well in monsoon and yield at its stipulated time. In this model we work on cubic meter so the vegetables selected should have small leaves so that sunlight gets distributes across the farm. And also the harvesting period is not overlapped,” he explains. In future Mr. Mishra plans to have a complete range of seasonal agri products that can be supplied to the direct consumers straight from the farm. “I want to create a good mix of basket that fulfills their everyday requirement of food preparation. Next I want to extend multi-layer farming model to one acre and diversify into fruit cultivation. I shall begin with papaya and banana as its ROI (return on investment) is just one year then shall grow other fruits that are in alliance with the climatic conditions of my village. I plan to grow mango, pomegranate, guava and litchi etc. My another goal is to increase the customer base to atleast 100 by the end of the year and turn my entire village into organic,” he reveals. “After working in cities and doing business for a short period, I am now contented to be a farmer and determined to make it big in farming. Also I am firm to continue only and only organic farming because I want to produce and sell nutrient rich food and not poison! Bright prospects in agriculture in our country is exclusively through organic farming,” Mr. Mishra concludes. Previous PostPrevious “60 Khillar desi breed cows are the biggest asset of my farm.” – Ashok Ingole, Satara district, Maharashtra.